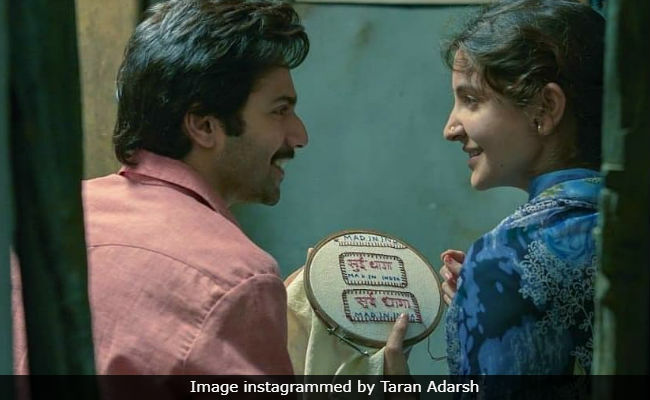 The box office collection of Sui Dhaaga, starring Anushka Sharma and Varun Dhawan, benefitted from the Gandhi Jayanti holiday on Tuesday, as per trade analyst Taran Adarsh. The film crossed over Rs 50 crore-mark five days after it opened in theatres. "Sui Dhaaga takes full benefit of National holiday on Day 5 and hits double digits... Crosses Rs 55 crore," he tweeted and added that the sixth day of the film's collection, which comes after a holiday will be crucial in shaping the film's success story. As per the box office numbers shared by Taran Adarsh, the film's third business day (Sunday) was the most successful so far. Sui Dhaaga opened across 2,500 screens. #SuiDhaaga takes full benefit of national holiday on Day 5 and hits double digits... Crosses 55 cr... Day 6 [Wed] - a working day, coming after a big holiday - is crucial... Fri 8.30 cr, Sat 12.25 cr, Sun 16.05 cr, Mon 7 cr, Tue 11.75 cr. Total: 55.35 cr. India biz. Speaking about Sui Dhaaga's success, Taran Adarsh also said: "Simple is beautiful... Success of Sui Dhaaga reaffirms the fact that well-made films will always find an audience." Sui Dhaaga, directed by Sharat Katriya (Dum Laga Ke Haisha) and produced by Yash Raj Films, is the story of Mamta (Anushka Sharma) and Mauji's (Varun Dhawan) strenuous efforts to start a tailoring and embroidery business against all odds. The film opened to favourable reviews on Friday. Film critic Saibal Chatterjee, reviewing the film for NDTV, said: "Sui Dhaaga falls well short of perfection, but it never comes unstuck. It passes muster as a wholesome entertainer embellished with humour, warmth, authentic emotional trappings and actors adept at going seamlessly along with the flow." Sui Dhaaga released along with Vishal Bhardwaj's Pataakha, which collected Rs 6.55 crore in the same time.